Our CoolAIR switch is a smart manual radiator fan switch that uses the standard radia.. The SmartMoto Dealer Mode Switch allows you to enable the dealer mode on a SUZUKI mto.. 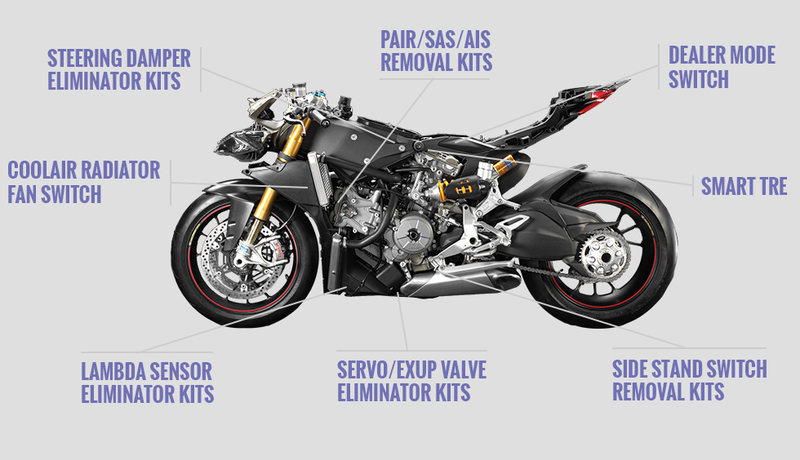 The SmartMoto o2 sensor eliminator kit eliminates the o2 sensor system without enabli.. The SmartMoto PAIR valve removal kit combines the electronic PAIR valve eliminator wi.. The SmartMoto SCS / DLC Switch connects to the DLC connector and allows you to enable.. The SmartMoto Servo / EXUP eliminator removes the EXUP system without enabling the EC.. The SmartMoto Side Stand Switch Eliminator is a plug and play device that is connecte.. The SmartMoto Smart TRE bypasses the timing retard to all Suzuki models and gives the.. The SmartMoto Steering Damper Eliminator is a plug and play device that is connected ..